Now do you see why I am so excited? By the way for those of you who have never seen the movie, I have included the film's trailer to give you a little more insight. Oh sure, I guess I could give you a brief synopsis instead. But then you wouldn't get to see the charming and talented Kerri Russell in the title role. Previews for Waitress are set to begin at the Brooks Atkinson Theatre on March 25, with opening night scheduled for April 24. Now for those of you who have never been in the Brooks Atkinson Theatre, it is one of Broadway's smallest venues. That means that there is not a bad seat in the house. Tickets for the show went on sale last month. Not only that but we sell them. In fact we sell every show both on and Off-Broadway. 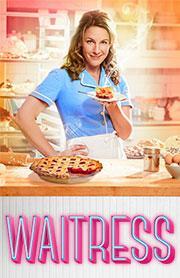 Get your tickets to see Waitress on Broadway at the Brooks Atkinson Theatre. I can't wait. Until next time theatre fans.